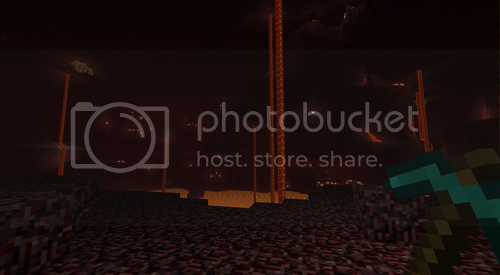 Notch just posted a screenshot of the new Hell World dimension on his blog I will post the screenshot here. so how do you guys like the look of it? He also said more info next week so there must be something else. I'm guessing that minetracks and portals won't mix. This really looks ****ing amazing. I wish the entire game had this kind of atmosphere. You could spend your whole game in hell, lolz! Are those random fires I see? You kidding, they should be killerbee's! I cried a single tear of joy. Thats a damn high amount of work for a few days. I thought it would look like the old indev Hell theme on the floating setting, but this is even better than that. ^me being chased after poking my head inside Hell for 3 seconds. Wow. That really looks wild. This does answer one question. the new material is some kind of dirt and apparently, very common. Something tells me it isn't likely to be used in any new recipes. Five new block types you say though? Humm... Any bets that one of them is important for making portals?